In 10 years’ time, maybe sooner, almost all of the beech trees in Haliburton County will be dead, dying or gnarled. According to Ministry of Natural Resources researchers, beech bark disease is making a rapid sweep of the province’s forests killing trees. In this county, many stands already have the disease, which is actually a deadly insect-fungus duo that reduces the trees’ natural resistance and infects its bark with circular cankers. The disease has travelled so quickly, both researchers and local foresters struggle to keep up with almost no hope to stop the spread. “The more you look, the more you find. It’s a serious disease in Haliburton County,” says James Munn, a forestry technician with Bancroft Minden Forest Company. Munn works on Crown land and said upwards of 85 per cent of the forests he’s seen in the northwest of the county as well as around the Cardiff area have the disease. “It appears to be coming from the west to the east,” he said. Schleifenbaum has changed his plan for Haliburton Forest, choosing to remove the beech while the tree is still usable. That said, beech, with its grey-coloured grain, isn’t in high demand. “There isn’t that much made out of beech,” Schleifenbaum said. “It doesn’t have a very stunning colour like white maple or orange cherry.” He speculates that because beech isn’t popular, fewer people are concerned about beech bark disease, which has received little attention in Ontario. But its effect on the ecosystem should cause concern. Beechnuts are food for bears, deer and birds and provide habitat for cavity-nesting birds, MNR scientists say. Sylvia Greifenhagen, research forester with the Ontario Forest Research Institute of the MNR, said it’s hard for her to predict what the outcome of the disease will be, given its rapid spread. “The disease hasn’t been in Ontario for very long. We don’t know how it’s going to work and what the consequences are going to be,” she said. They can look to the East Coast, where beech bark disease has been for more than 50 years and where the trees that remain are pockmarked and sickly. There has been some success in the States with selective harvesting to promote the few disease-resistant beech trees, but so far no one has found a way to prevent spread. Beech bark disease involves a European insect called a “beech scale,” introduced to North America in the 1890s, which eats tree bark and lives in the tree. Scale injures the bark enough to open it up to the second part of the disease, a canker fungus. Once infected, the tree will live another few years at most. Minden Area Fish and Wildlife Council chairwoman Kim Roberts has seen the disease in action on her property. Roberts thinks it’s more widespread than most people think because it’s not easy to spot. “I don’t think people are aware of the disease,” Roberts said. The wind blows the scale insect from tree to tree, so once it’s in a forest, it spreads easily. “We found one in our bush here about a month ago,” Roberts said. “When it goes, the fungus on it looks like shaving cream that has gone dry. … We went back maybe two weeks later and the tree was laying on the ground.” Roberts is a hunter and sees potential food sources for bears disappearing along with the beeches. She worries it will hurt the population and cause more bears to visit homes and cottages for food rather than staying in the woods. Forestry consultant Peter McElwain sees another problem: public safety. “It’s a huge safety hazard for anyone who recreationally uses property,” said McElwain, who has been in forestry for 33 years. Infected trees fall over and their branches fall off. In a stand with a high number of beech trees, driving an all-terrain vehicle down a forest path might not be as safe as it once was. Like his colleagues, McElwain is having a hard time keeping up with beech bark disease. “We are experiencing our own difficulties in managing it and getting a handle on … how it’s spreading, how fast it’s spreading, how fast [it progresses] from the beech scale to the beech bark disease,” he said. His goal with his company Forest Design is to diversify forests with a high concentration of beech trees and to advise clients on how to deal with their beech trees once the disease hits. “You don’t want people to think you have to go and cut all of your beech trees,” he said. Replacing beech trees is an imperfect science. “Black cherry and red oak are the two other main mast [food] producers that could replace the wildlife component,” he said. The problem is, McElwain said, those trees don’t flourish where beech does. While beech tolerates the shade, black cherry and oak do not. Beech tends to grow in deeper soil, while the other trees like rocky sites. “They’re not a perfect fit,” he said. What upsets McElwain the most is how blindsided everyone has been by the disease. “We feel disappointed that somebody’s let us down … Why were we not informed that it was coming and the destruction it would have?” he asks. Schleifenbaum sees the disease as another wave of what has become a regular tide of invasive species in Ontario. While beech bark disease spreads on its own, transportation of firewood from southern Ontario to cottage country and beyond has certainly accelerated its movement. Schleifenbaum said in order to prevent more diseases and species from entering our ecosystem, people must stop transporting plants, soil and firewood from other places to Haliburton County. “They shouldn’t bring soil from their suburban gardens,” he said. 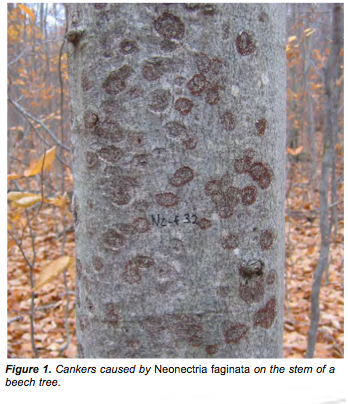 Beech bark disease (BBD) is a non-native insect-fungus complex caused by the beech scale (Cryptococcus fagisuga) and the canker fungus Neonectria faginata.